Welcome to the web site of the "Battle of the Maroons", an exclusive website launched in 2010, the year in which this historic cricketing encounter was played for the 81st time. Nalanda having come into existence as an off shoot of Ananda in 1924, a "Big Match" was initiated between the two brotherly schools with the aim of building relations between students of the two institutions and developing their cricket in the sporting arena. Thus the first Battle of the Maroons was played between Ananda and Nalanda in 1924. Soon the Big Match began to be played with much pride and fanfare and became the most awaited and cherished event for all those connected with both schools. A fine tradition was built over the decades while the cricketing abilities of both schools grew surpassing other cricket playing schools in the Island. The Battle of the Maroons gradually became a symbol of the brotherhood between Ananda and Nalanda that has been unique in a country where many schools try to outdo their counterparts. 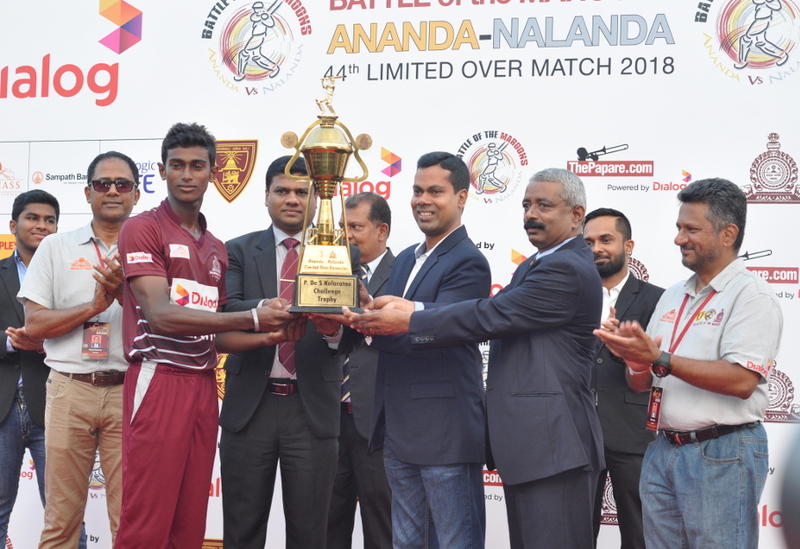 The 90th Battle of the Maroons cricket encounter between Ananda and Nalanda ended in a draw despite some brilliant performances by members of both teams. Nalanda skipper won the toss and elected to bat after a colourful opening ceremony in the presence of Sri Lankaâ€™s first Test Cricket captain, Bandula Warnapura, our world cup winning captain Arjuna Ranatunga and several Sri Lankan cricket greats of the past hailing from the two schools including Lalith Kaluperuma, Asanka Gurusinghe, Gamini Wickremasinghe, Dhammika Ranatunga, Hemantha Devapriya, Susantha Karunaratne and Sanjeewa Ranatunga. Nalanda who were favourites going into this match having performed very well during the school season, put up a formidable score of 269 for 7 wickets before they declared their innings. Their total was set up mainly by a superb knock of 120 runs by opener Avishka Perera who scored these runs off 134 deliveries with 17 fours. Raveen de Silva was the second highest scorer for Nalanda with 36 runs and for Ananda , Chamika Gunasekara and Saviru Bandara captured 2 wickets each for 46 runs and 66 runs. Ananda in reply found themselves in a spot of bother at th eend of the first day at 52 for four with Dineth Samaraweera claiming three wickets for 22 runs. But on the second day Ananda fought back with Moditha Ranatunga (64) and Janidu Jayawardene (63 n.o.) scoring well compiled half centuries to recover to 232 all out having been 55 for 5 at one stage, at which stage Nalandians had high hopes of a long awaited victory in the series. Dineth Samaraweera ended up with figures of 4 for 63 while Chamindu Wijesinghe captured 3 Ananda wickets for 58 runs. Nalanda in their second innings scored 216 for 5 wickets at close of play with their skipper Lakshitha Rasanjana scoring 87 and Chamindu Wijesinghe supporting him well with a knock of 64 runs and adding 109 for the third wicket. It was a match that had an unprecedented crowd enjoying the carnival atmosphere throughout the two days which featured exemplary spectator behaviour with almost no invasions of the field, even though the cricketers came up with some excellent performances including a Big Match century, which is a rare achievement. 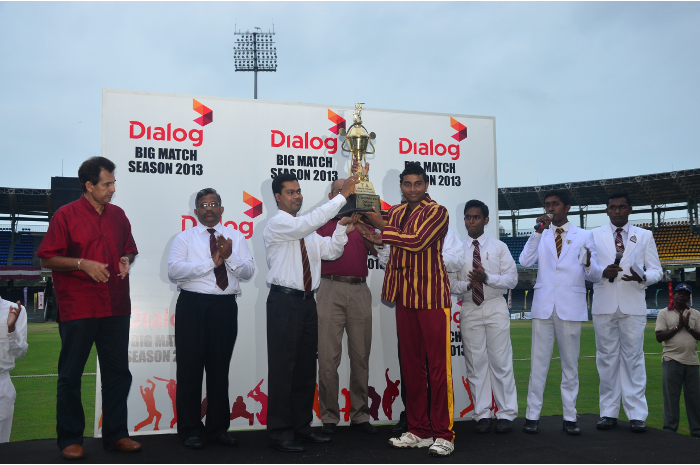 The match awards were presented by Mr Supun Weerasinghe of Dialog Axiata together with the two Principals Mr S M Keerthiratne of Ananda and Mr Thilak Waththuhewa of Nalanda and the Co Chairmen of the Battle of the Maroons Organising Committee Manjula Wijemanna and Mohan Gunadasa. Yes, even on this 90th occasion it will not matter how many runs you scored, how many wickets you captured, how many catches you held or even whether you were an Anandian or whether you hailed from Nalanda as long as you played this game in its true spirit as a gentleman. The way this noble game is played has changed so much during these past years, due to commercialisation and media exposure, especially live television coverage of matches, it is near impossible to expect the game to be played the way it ought to be. Were there heroics like jumping in the air and doing a â€œsword fightâ€� with the bat by batsmen on reaching a significant score. Did a bowler have to show the dressing room to a batsman, the moment his wicket was captured? Didn't a fielder usually know whether a catch he took was cleanly held or whether the ball touched the ground before he grabbed it. Didn't we have batsmen who knew for sure when the ball touched his bat when it passed him on the way to the wicket keeper and walked out without any referrals? Didn't we have players giving more credit to their team members than taking the honours themselves and appreciating and thanking every one who helped them, when they were praised on the victory podium. Lets pause a moment to reflect upon all the good qualities we witnessed on the playing field in the years gone by. Just like how we should conduct ourselves, and treat our opponents in a game of cricket - even in the game of life, we will, one day be judged by the way we treat the world, how ethical we are in our actions, how respectful we are in treating those we interact with irrespective of their social standing or status in life. Let the "Battle of the Maroons" be a shining example in promoting these good qualities in our future generations as we celebrate the important 90th milestone in this journey. On 2nd March 2019, the Cricketers of Sri Lanka's two premier educational institutions walk in to the middle of a Colombo's leading cricket ground for the 90th time. Hey.. It is the 'Battle of the Maroons', once again! 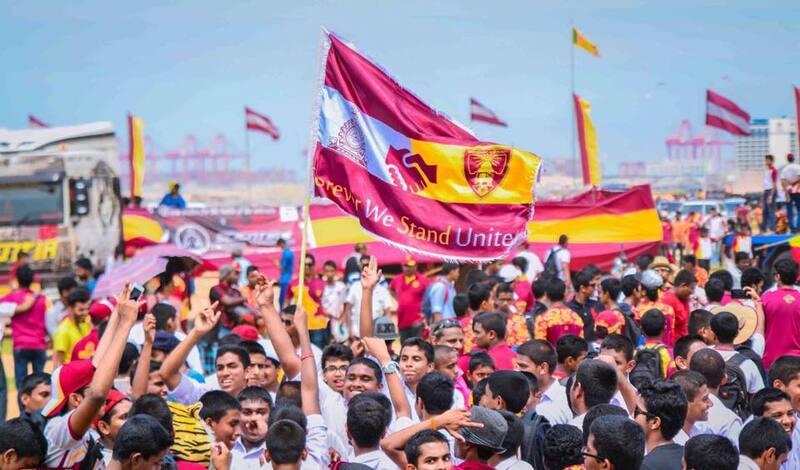 During the two days the City of Colombo will witness the glamour of Maroon and Gold and Maroon and Silver colours. The big match fever has already started with the 'Battle of the Brothers' taking place in the last weekend of February. The ambiance of the ground and the electric atmosphere it presents will enthral any spectator, old boy, parent and student. The Battle of the Maroons is said to be having the highest number of 'Papare' bands, the raucous rhythms of these bands, makes everyone at the grounds dance. The fun atmosphere and the loud music entices any onlooker at least to step to the beat of 'Papare'. The big match fun has evolved over times. 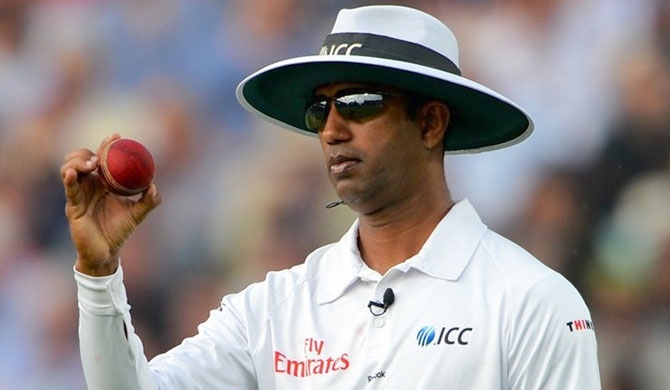 Kumar who was an integral part of the victorious Sri Lankan world cup team of 1996, was selected as one of the twenty umpires to stand in matches during the 2015 Cricket World Cup of which he umpired in the final. Thus he holds the unique record of being the first to play in and to umpire a final of a World Cup Cricket match. He also officiated in the final of the 2016 ICC World Twenty 20. The BoM Joint Committee wishes Kumar continued success as he remains "close to the game" which he loves so much. BoM Joint Organising Committee wishes to express its profound grief at the demise of Mithra Wettimuni who played for Ananda from 1967 onwards and captained their team in 1970. As a brilliant right-hand bat and an off-spin bowler at Ananda he also proved to be a shrewd captain, leading the Ceylon Schools team on its very successful cricket tour to India in 1969-70. Mithra Wettimuni went on to play for Sri Lanka later and won the nations 22nd Test cap in 1983 and is well remembered for opening the batting for Sri Lanka with his brother Sidath in the Test series in New Zealand that year. The BoM joint organising committee extends its deepest condolences to his family. Having decided to field after winning the toss, Nalanda bowlers threatened to run through the Ananda batting claiming 3 wickets for 57 runs after the Ananda openers had made a somewhat steady start with a partnership of 29 runs. It was at this stage that Ananda skipper Ashel Sigera took control of things and shared two good partnerships, 49 runs for the fourth wicket with Dushan Hettige who scored 33 runs and 78 for the fifth wicket with Lahiru Hiranya who scored 38. Sigera was out in the 49th over when he was stumped for a well compiled 87 and by that time he had made sure Ananda reached a formidable total of 244 all out, a score that many thought was not possible even well past the half way stage in their innings. Skipper Lakshitha Manasinghe bowled best for Nalanda for figures of 3 for 48 while Chamindu Wijesinghe and Kaveesh Madurapperuma bagged two wickets each for 31 runs and 40 runs. Nalanda openers, Ranindu de Silva (36) and Avishka Perera (21) started off at a rapid pace and put on 63 runs for the first wicket before another two wickets fell in quick succession to make them 66 for 3. Their Vice-captain Suhanga Wijewardena who joined Dilhara Polgampola then put on a match winning partnership of 95 runs for the 4th wicket between them, scoring 68 and 37 respectively. When Suhanga was out with the score at 196 Nalanda looked much confident of victory which they achieved with ease in the 44th over, with some sensible batting by Chamindu Wijesinghe and Raveen De Silva who remained unbeaten on 48 and 19 respectively. Thus Nalanda clinched their second consecutive win in the series and was presented the P de S Kularatne Memorial Challenge Trophy while the match awards went to the following players for their outstanding performances. 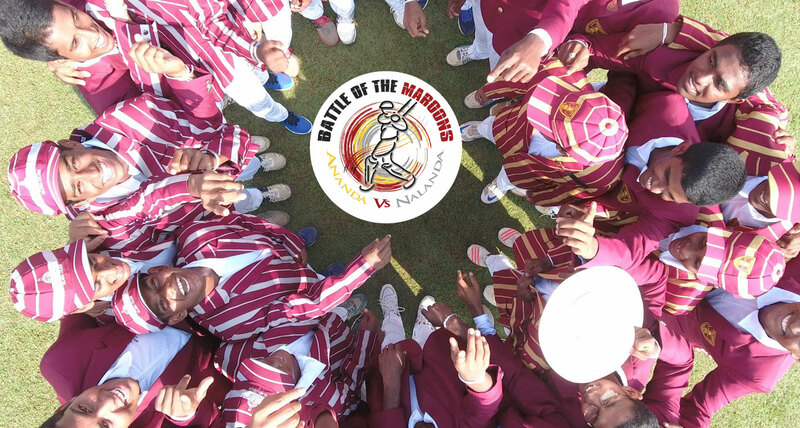 The 89th Battle of the Maroons ended in another draw but provided some brilliant individual performances by players from both Ananda and Nalanda, in a game that promised to be a close tussle by the end of the first day. Having won the toss, Nalanda Skipper Lakshitha Manasinghe invited Ananda to take first lease of the SSC wicket and his pace bowlers Suhanga Wijewardana and Chaminda Wijesinghe, soon had the Ananda batsmen in trouble during the post lunch session sending them reeling to a total of 67 for 6 wickets at the break. Ananda had to rely heavily on a superb knock of 58 by Lahiru Attanayake (with 7 fours and a six) and Daminda Reshan who scored 24 while sharing a 51 run partnership between them, to reach a somewhat respectable score of 141. Chamika Gunasekera was the only other batsman for Ananda with a noteworthy contribution to the total with an unbeaten 18 runs. Nalandaâ€™s pacemen Suhanga Wijewardene and Chaminda Wijesinghe bagged 6 wickets for 52 runs and 4 wickets for 33 runs thus demolishing the entire Ananda batting line up between them. Nalanda in reply soon found themselves too in trouble having lost their first wicket in the second over of the innings but found some solidarity with Avishka Perera (24) and Dilhara Polgampola (23) putting on 41 runs for the second wicket before another two wickets fell in quick succession. Their skipper Lakshitha Manasinghe then batted with a positive approach to end the first day with an unbeaten 32 taking the Nalanda total to 107 for 5 wickets at close of play. He continued with his good form on the second day and shared a partnership of 67 runs for the sixth wicket with Ravin de Silva, before being stumped off the bowling of the rival skipper Asel Sigera for a well compiled 72 runs with 8 fours and one six. Asel Sigera and Gishan Vishwajith claimed three wickets each for Ananda whileShamal Hirushan chipped in with two wickets to bowl out Nalanda for 213 which gave them a lead of 72 runs. Ananda commenced3 their second innings after lunch on day two and they progressed to 85 for 3 with opener Kanishka Ranthilakage scoring 25 and Dushan Hettige making 23. Skipper Asel Sigera and Kamesh Nirmal then produced a magnificent partnership of 75 runs for the fourth wicket to guide Ananda to safety from any ideas that Nalanda bowlers had in forcing a win. Asel Sigera fell short of a well deserved half century being dismissed for 46 with five fours and a six and Lahiru Hiranya then joined Nirmal to put up another useful stand of 74 for the fifth wicket. Kamesh Nimal ( the younger brother of current Sri Lanka skipper Dinesh Chandimal) continued with his brilliant form to reach a well compiled unbeaten 100 runs which included 13 boundaries and the match was concluded soon thereafter with no possibility of a result with the Ananda score at 252 for 7 wickets in their second innings. The Battle of the Maroons joint organising committee congratulates Dinesh Chandimal ( Ananda skipper of the 80th Maroons Battle) on his inspiring leadership to put the Sri Lanka team back on the winning track together with our new coach Chandika Hathurusinghe, also a product of Ananda College, and team manager Asanka Gurusinghe , the Nalanda captain of the 1985 encounter. It was great to see Sri Lankans dominating the last three matches and winning the TriNation tournament in Bangladesh on Saturday ( 27th Jan) in grand style. As Sri Lankans get ready to take on the challenges of a Test series ahead of them, the BoM committee wishes all three of them and their young team all the very best for many more successes in the future. The Battle of the Maroons Joint Organising Committee recently presented Rs 1 million each to the Principals of Ananda and Nalanda, from the profits made at the 88th Maroons Battle ( of 2017). Past joint committee chairmen Old Anandian Mr. Lal Hewagama and Old Nalandian Mr. Sanjeewa Perera presented the cheques to two principles at the Ananda College premises. The Joint Organising Committee takes pride in the fact that they have been able to contribute more than Rs 10 million each from the profits made at their Big match since the joint committee undertook organising the match. The newly elected Joint committee chairmen for next term Mr. Manjula Wijemanna from Ananda College and Mr. Mohan Gunadasa from Nalanda College, together with other committee members were also graced the occasion. 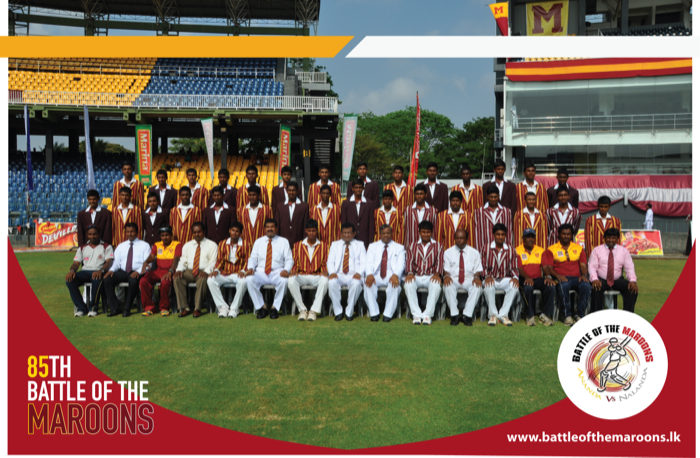 The 89th battle of the maroons encounter scheduled to be held on 03rd and 04th march at SSC grounds. 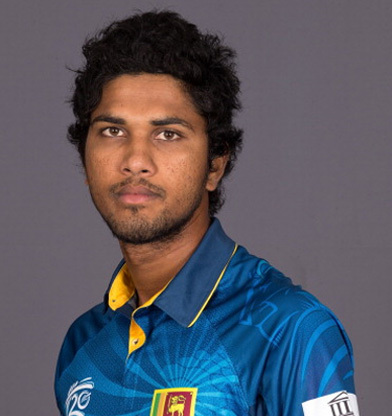 The Battle of the Maroons Committee wishes Dinesh Chandimal a very successful tenure as captain of Sri Lanka Cricket. We wish him well as he takes on the important task of reviving Test cricket in Sri Lanka to its past glory. 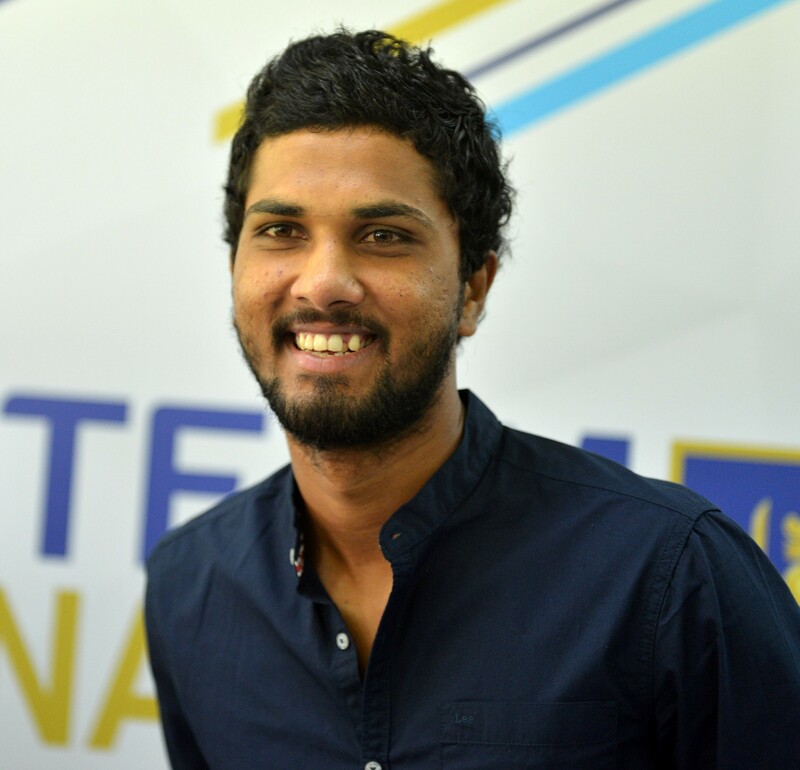 Our wishes also go out to Angelo Matthews, for greater success as he continues to serve Sri Lanka cricket with his brilliant performances. It was a cliff hanger and a roller coaster of a game which brought every spectator to the edge of their seats in a nail biting finish to an incredibly closely fought match. What ever terms you use to describe the 43rd One Day encounter between Ananda and Nalanda , ( played on Sunday 19th March at the SSC grounds) it turned out to be one of those rare occasions when all 3 results of a match becomes possible depending on the outcome of the last delivery. When Ananda's batting star, Sammu Ashan was entrusted the task of bowling the last over of the match, with only 5 runs to defend out of a total of 257 that Ananda made, he did not show any reluctance to take up that challenge. And how well he took up the task and tightened the grip on the Nalanda pair for the 9th wicket, giving away only 4 singles in the first 5 balls and Nalanda's Kasun Sandaruwan had the task of scoring 2 runs to win off the last ball. Kasun's mighty swing off that last delivery did not connect well, but it was good enough for the batsmen to scamper for a single and more importantly, come back for the winning run as well, while the Ananda fielders tried their best to prevent it. Thus, brought a well fought out victory for Nalanda in this 43rd one day encounter after 7 years in a match that took so many turns throughout the day after Ananda won the toss and put on an imposing total of 257 runs. For Ananda Sammu Ashan scored a well compiled 96 runs with 5 massive sixes while Asel Sigera with 42, skipper Kavishka Anjula with 38 and Kavindu Gimhan who scored 31 were the other main contributors. Kalana Perera, Malinga Amarasinghe and Asel Kulatunga shared the bowling honours for Nalanda with 2 wickets each. Nalandians in reply kept scoring at a brisk rate but the Ananda bowlers didn't allow any of the batsmen to take the game completely away from them at any stage. Malinga Amarasinghe top scored for Nalanda with 67, while skipper Dasun Seneviratne 32 and Avishka Perera 25 were the other two main scorers apart from Kasun Sandaruwan who ultimately became their hero with a match winning score of 57 not out Sammu Ashan and Asel Sigera bagged two wickets each for Ananda. When the winning runs were scored by Nalanda, a large number of spectators swarmed the arena but considering the tight finish and the tense moments that this match went through, it was certainly the friendly atmosphere and the brotherly spirit in which the game was played that enabled the spectators to witness one of the most exciting finishes in this series. The match ended in a draw, but not without the suspense that remained in the minds of the spectators well past lunch on the second day, as Ananda tried their best to make inroads in to the Nalanda second innings having declared with just 46 runs ahead in their first innings. The skipper Kavishka Anjula himself took 3 wickets for 37 runs and was ably supported by Chamika Gunasekera (2/23) and Supun Waragoda (2/26) as they bundled out Nalanda for 144. Only Suhanga Wijewardena 37, Madushan Hasaranga 31 and Avishka Perera 26 made notable contributions to the Nalanda total. Ananda in reply was 160 for 5 wickets at the end of day one with Shammu Asan unbeaten on 60 and Dushan Hettige with 37 and Kavishka Anjula with 25 having helped them put up some quick runs to overtake the Nalanda score. Day 2 saw Ananda losing 3 wickets as they piled on another 30 runs and closed their innings at 190 for 8 with a lead of 46 runs. Kalana Perera and Asela Kulathunga bowled best for Nalanda claiming 3 wickets each for 35 runs and 47 runs. Malinga Amarasinghe also chipped in with 2 wickets for 31 runs. 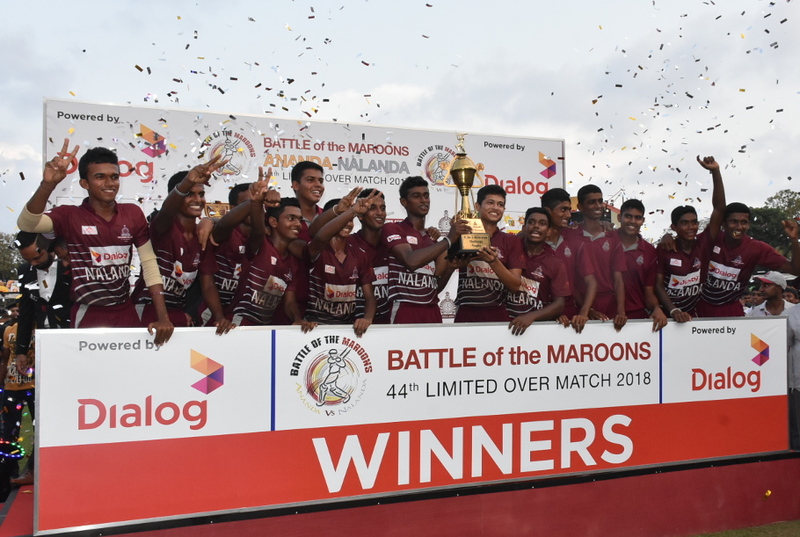 They scored a formidable 280 for 4 wickets before the match came to an end with Lakshitha Rasanjana emerging as the star of the 88th Battle of the Maroons with an unbeaten knock of 113 runs that comprised 11 fours and a six. Kasun Sandaruwan scored an unbeaten 50 with five fours while Suhanga Wijewardana and skipper Dasun Seneviratne contributed with scores of 44 and 39 in their second innings. It was commendable to see only 3 spectators rushing to the middle to congratulate Lakshitha Rasanjana even after he reached such an important milestone of a Big Match century. This too was done with the minimum disruption to the proceedings of the match, quite contrary to what usually happens on such occasions. 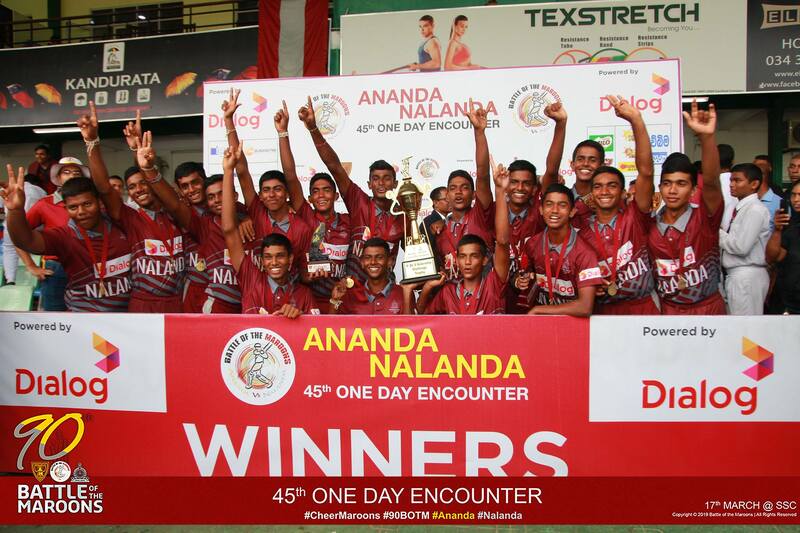 While he helped Nalanda to come out strong in this 88th Maroons battle, the sportsmanship and camaraderie that was amply demonstrated both on and off the field helped making the ties of brotherhood between Ananda and Nalanda even stronger. Nalanda College 1st innings - Nalanda 144 all out in 51.5 overs: Suhanga Wijewardana 37, Madushan Hasaranga 31, Avishka Perera 26 , Kasun Sandaruwna 19, Kavishka Anjula 3/37, Chamikara Gunasekara 2/23, Supun Waragoda 2/26. Nalanda all out for 144 runs. Suhanga Wijewardena 37 runs. Kavishka Anjula 3 wickets for 37 runs. Ananda 160 for 5 wickets with Shammu Ashan not out 60. For Nalanda Asela Kulatunga 3 wickets for 43 runs. 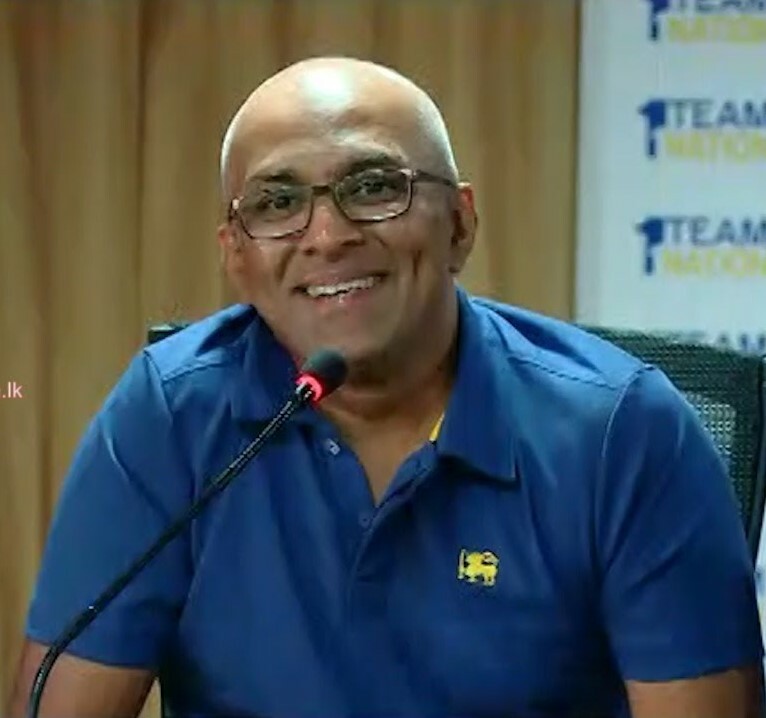 Maroons take pride in the fact that Asanka Gurusinghe, has recently been appointed Sri Lanka's Cricket Manager and are confident that his managerial skills will be a source of strength for Sri Lanka's future in cricket. Gursinghe is well known as a technically accomplished No. 3 batsman and is described as the rock on which the Sri Lankan batting was founded for 11 years. He is fondly remembered by all Sri Lankans for his match winning partnership with Aravinda de Silva, which brought glory to Sri Lanka in the world cup finals in 1996. The maroons also remember him as the Nalanda Captain of 1985 who scored a stylish century in their big match that year. The Battle of the Maroons Joint committee wishes Asanka Gurusinghe, another brilliant performance as Sri Lanka Cricket Manager. The Battle of the Maroons Joint Organising Committee was formed in 2009 with a view to reviving the enthusiasm and interest of the Ananda Nalanda match and since then this event has been organised with great success and fanfare. This is the 9th occasion the joint organising committee has been entrusted with this huge task which they have been very successfully handling over the years. There are over 150 eminent past students, 250 Prefects and Teachers of the two schools who jointly work to achieve this gigantic task. From the inception many new features have been added every year to the event and this year we expect a crowd of over 15,000 per day. During the past vehicle parades to coincide with the match, were organised separately by students and old boys of the two schools on their own. In view of certain disturbing events among Sri Lankan school boys in the recent past the Police department was not in favour of granting permission for such vehicle parades this time. 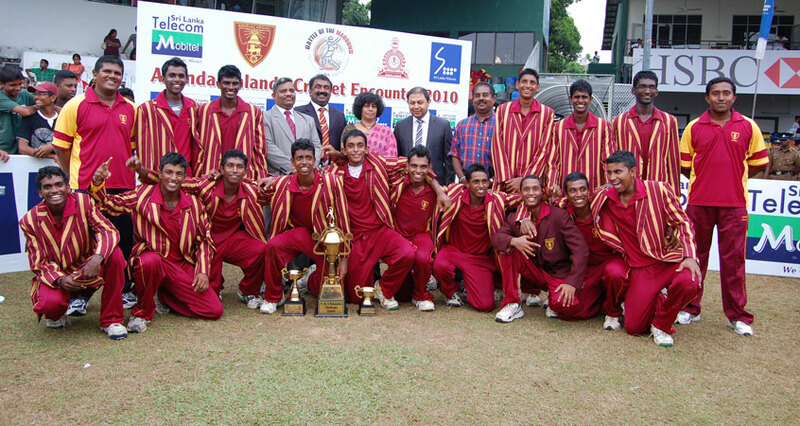 It was against this background that the Joint Organising committee was able to obtain approval from the Police Department for a joint vehicle parade, for the first time in the history, with the participation of both schools subsequent to a meeting we had with the Senior DIG Colombo and several senior police personnel, with regard to orgainising the match. This historic event was held on Saturday 25th February. Old Boys of Nalanda lined up with their cars along Sri Dhamma Mawatha and reached Ananda Mawatha through Temple Road. The Anandians lined up along Ananda Mawatha then joined with the Nalanda crowd and the parade commenced around 8.30 am. Having taken the route through Kularatna Mawatha, Punchi Borella, Borella Junction, Ward Place, Eye Hospital Round about, Union Place and Slave Island Junction all of them reached the Galle Face Green. With more than 250 vehicles participating in the event not a single violation of traffic rules nor any type of misbehaviour was reported. There was a large crowd that gathered to witness this parade and every one was very happy to see the unity among the two greatest Buddhist institutes in Sri Lanka. Upon reaching the Galle Face Green the participants were treated with some fabulous music which all of them enjoyed. Co-Chairmen of the BoM joint committee Lal Hewagama and Sanjeewa Perera addressed the gathering and pledged that this will be made an annual event in the future. The Principal of Ananda College, S.M. Keerthiratne also graced the occasion and everyone was appreciative of his participation and the contribution he made towards the success of the parade by taking a firm and courageous stand at a time the unity of Ananda and Nalanda had been placed at stake. 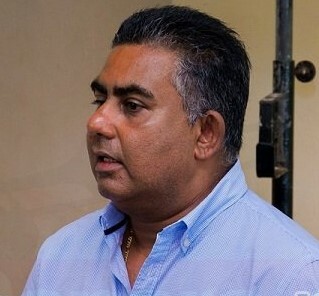 The BoM Joint organising committee feels that a lot of credit in organising this event on a grand scale should go to the Head Prefect,Pasindu Herath and the Prefects Guild of Ananda College. Their untiring efforts with their presence along the entire route, helping in controlling the traffic and helping people along the way was truly commendable. The BoM joint committee notes with much sadness that prefects and students of Nalanda College were denied of this great experience. The Principal of Nalanda College did not seem to have recognised the importance of this exercise to strengthen the brotherhood among the two groups of students. It is rather unfortunate that they did not have the opportunity of being a part of this historic event and gaining valuable exposure on how diverse forces can combine as one team to achieve a common goal. 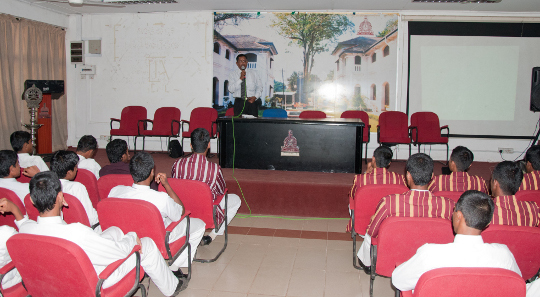 The Battle of the Maroons Joint organising Committee recently organised a very interesting leadership development workshop for students of the two Colleges at the DIMO Training Centre with the kind assistance of DIMO Managing Director Mr Ranjith Pandithage , himself an alumni of Ananda College. The program was held at the state of the art auditorium of DIMO Ltd and about 250 prefects from the two schools who were present were enthralled by the delivery of two well known corporate trainers, Mr Deepal Sooriyarachchi an alumni of Ananda and Mr Dhammika Kalapuge an alumni of Nalanda, who are well reputed for their excellent presentations to many diverse forums. Representing the BoM organising committee at this program, were Mr Jayantha Wickramasinghe President of Ananda OBA , Air Marshal Gagan Bulathsinghala Executive President of Nalanda OBA, Lal Hewagama Co Chairman Ananda College and Sidath Widyasekera, former Co Chairman Nalanda College of the Battle of the Maroons Joint Committee. Ananda's Deputy Principal Mr Sarath Gunathilake and the Masters in Charge of Prefects for the two schools also graced the occasion. The prefects were very appreciative of the initiative taken by the BoM Joint committee to arrange this program, and expressed their profound thanks to the two trainers at the end of the session. Most of them commented that this was a unique life changing experience that would mould their characters and inspire them to do something to change the world and that the brotherhood that was further enhanced through this interactive session will certainly lead to Ananda and Nalanda continuing a lasting bond. The BoM joint organising committee that has thus made a remarkable start to the 88th encounter, are most grateful to Mr Deepal Sooriyarachchi and Mr Dhammika Kalapuge and also to Mr Ranjith Pandithage for their assistance and Ananda OBA President Mr. Jayantha Wicramasinghe for taking the initiative and arranging sponsors to successfully conduct this program. In a match that saw fortunes swinging from one side to another during a major part of the day, Ananda finally won the 42nd One Day encounter, with a convincing margin of 38 runs, thus registering their 6th successive win in this series. Having been put into bat, Ananda had an early scare at 5 runs for the loss of 2 wickets and then slipped to 30 for 3 before some sensible batting by Sammu Ashan who scored 54 runs and put on a 76 run partnership for the 4th wicket with Asel Sigera who contributed with 30 runs, steadied their innings. However they slumped to 171 runs for 8 wickets around the 35th over and Nalanda were sensing a victory target in the region of 200 to 225. Ananda's vice captain Kavishka Anjula did not want to give in that easily and stroked a superb unbeaten 100, his century coming in the penultimate ball of their innings, having shared a 96 run stand for the 9th wicket with Dinuka Gimhana who scored 30 runs. Nalanda's Kalana Perera with 2 for 35 and Umeshka Dilshan who had figures of 2 for 43 were the best bowlers for Nalanda. Ananda finally ended up with a formidable score of 271 and Nalanda were equal to the task and were proceeding steadily at 171 for 2 at one stage with opener Nimnaka Ratnayake and Lakshitha Rasanjana sharing a second wicket partnership of 134 runs while both scoring 71 runs each. Having lost 4 wickets thereafter at regular intervals and faced with an imminent defeat, Nalanda achieved some respectability through the batting of Suhanga Wijewardhane who scored 37 runs while Ashel Sigera took 3 wickets for 33 runs and Dileepa Jayalath captured 2 for 42 to bowl Nalanda out for 233 in the 49th over. Kavishka Anjula the Ananda Vice Captain was adjudged the Man of the Match while the Best Batsman's award went to Lakshitha Rasanjana of Nalanda. The Best Bowler award was won by Asel Sigera of Ananda and the Best Fielder of the match was Kasun Sandaruwan of Nalanda. The 42nd One Day Encounter between Ananda and Nalanda will not be played on Sunday 13th March as scheduled earlier, as a mark of respect for the late Mahanayaka of Asigiriya Chapter, Most Venerable Galagama Sri Aththadassi Thero whose last rights will be performed on that day. The new date for the one day match will be Sunday 20th March for which all tickets purchased for 13th March will be valid. "Battle of the Maroons Joint Organising Committee" wishes the supreme bliss of nirvana for the late Mayhanayake Thero. Maroons take great pleasure in congratulating and extending our warm wishes to Dinesh Chandimal , who captained Ananda in 2009, on his appointment as Vice Captain of the Sri Lanka T20 World Cup team. It was another draw, but the spirit of brotherhood that was displayed on and off the field was certainly the winner at the 87th Battle of the Maroons, which was worked out at the SSC on 5th and 6th March. Ananda skipper Nisal Fransisco won the toss and had no hesitation in inviting Nalanda to take first lease of the wicket expecting to take advantage of the life that the pitch would provide his bowlers. Nalanda batsmen took up the challenge and prevented any major collapses, and were finally bowled out for 197 with opener Nimnaka Ratnayake top scoring with 44 runs before he was caught at mid wicket having mistimed a shot towards the square leg area. Malinga Amarasinghe and Lakshitha Rasanjana also made useful contributions of 37 runs and 35 runs respectively. Supun Waragoda claimed 4 wickets for 13 runs for Ananda while Sammu Ashan and Dileepa Jayalath took 2 wickets each. When Ananda batted, skipper Nisal Fransisco and Rahal Avishka held the Nalanda bowers at bay to end the first day on 55 for the loss of one wicket. Resuming on day two Ananda batsmen clearly showed their intentions, as they rattled up 216 for 4 wickets before closing their innings. Rahal Avishka top scored for Ananda with 84 runs before being stumped by Kasun Sandaruwan off the bowling of Kavindu Bandara. Asel Sigera and Kaveeshka Anjula were unbeaten on 41 and 44 respectively when Ananda skipper made the declaration. Nalanda, already with a deficit of 19 runs, had a real real scare in their second innings when they lost 5 wickets for 42 runs with Sammu Ashan bagging the first 3 wickets to fall. However they managed to force a draw in this 87th encounter with skipper Dasun Seneviratne scoring 25 and Suhanga Wijewardana remaining unbeaten on 40 when the match ended with the Nalanda score at 109 for 6. It was off spinner Supun Waragoda who claimed the other 3 Nalanda wickets to fall and his match performance of 7 wickets for 41 runs earned him the Man of the Match award. Rahal Avishka and Sammu Ashan (both from Ananda) were adjudged the Best Batsman and Best Bowler respectively while the Best Fielder's award went to Nalanda's Lakshitha Rasanjana. In a match that attracted so much interest with Ananda trying hard to force a win only to be thwarted by the resolute batting by the Nalandians, there was one feature that won the hearts of the spectators â€“ the sportsmanship in which the game was played while the camaraderie in all the stands at the SSC was at it's best. The 41st limited overs match was concluded successfully on 16th at SSC.Ananda won the encounter by 05 wickets. 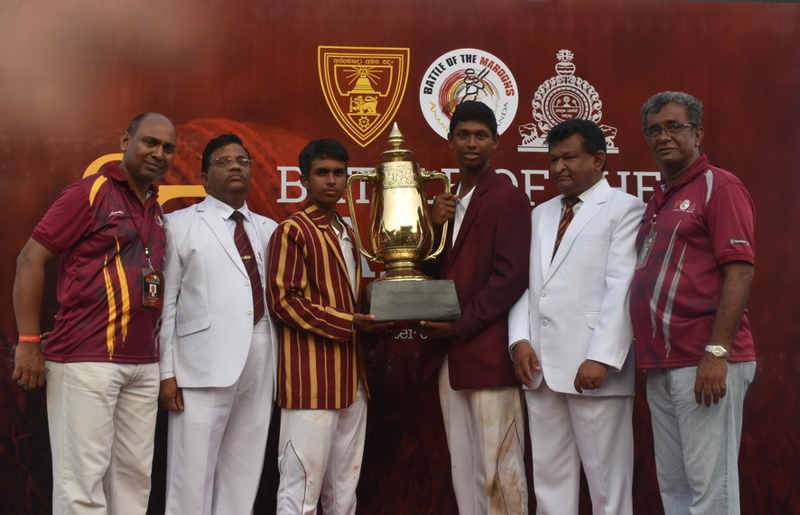 The 86th Battle of the Maroons inaugurated with the participation of two principals, teachers , students and the joint commitee officials of both schools. Nalanda won the toss and invited Ananda to bat. And at the end of the day the score card was as follows. 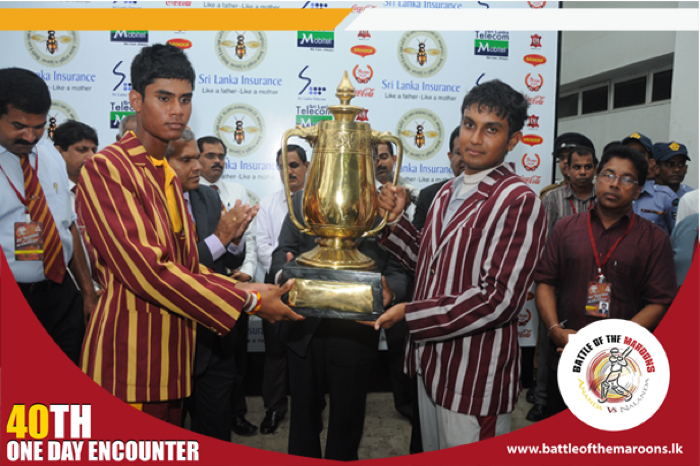 Played at the Colombo Oval on March 19th and 20th this was the 36th Battle of the Maroons. 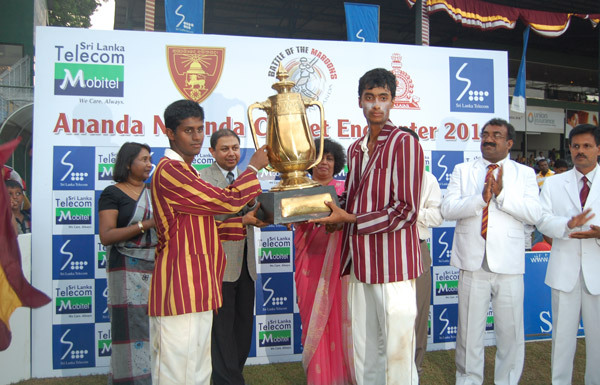 Anura Gamini Perera, one of the best batsmen in school cricket that year captained Ananda, and Shantha Peiris a fine all-rounder captained Nalanda. Going by the 1965 seasonÃ•s performance, Ananda had the edge over Nalanda having won three matches and lost one, while Nalanda had won one match and lost four. Ananda winning the toss decided to bat first on a wicket that looked full of runs. The players were greeted at the middle by two experienced umpires Lucky Mayo and M Hamer. Nalanda opened the bowling with their two left-arm pacemen Anura de Silva and A Ponnamperuma both bowling round the wicket. AG Perera and A Sumanadasa started the innings comfortably with the former in his typical style belting a couple of fours in next to no time. However, with the score at 19 Perera fell to a full-blooded pull shot which was smartly taken by Amaraweera who flung himself to his left. Then three more batsmen Ã� Laksman de Silva, Sumanadasa and Duminda Siriwardene Ã� were back in the pavilion within a space of half an hour. The ideal batting wicket played as expected with no surprises. It was the batsmen who surprised all, playing well below expectations. Struggling at 28 for 4 in 50 minutes Ananda had only themselves to blame for the disastrous start. The Ananda dressing room was not a happy one. 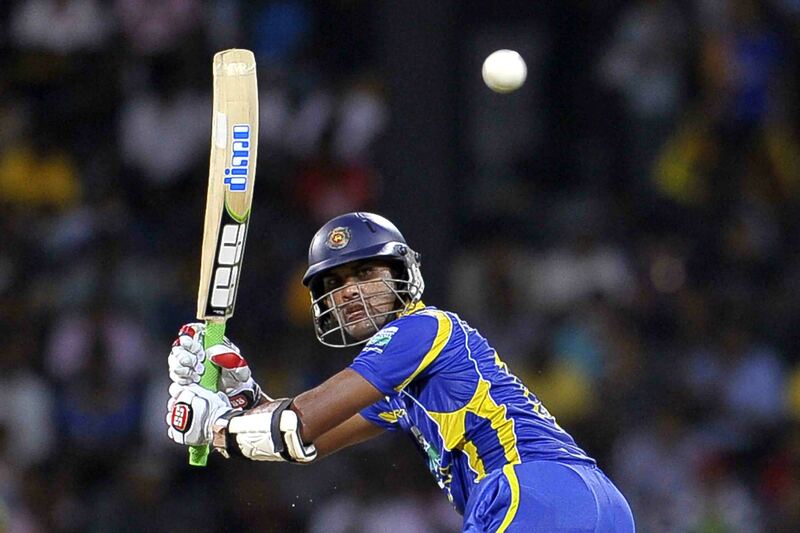 The early damage was done by Ponnamperuma and Vas Gunawardena and Anura de Silva. At this stage Ananda pinned their hopes on left-hander GC Perera and Tilak de Silva, who hit a century against St. BenedictÃ•s the previous year, to rescue the shambles of an innings. And rescue they did. Both batsmen batted with purpose and sound judgment punishing the loose ball to move the score to 91 for 4 at lunch. Our world cup winning Cricket Captain, Arjuna Ranatunga who represented the Ananda team in the Maroons Battle from 1980-1982, was recently appointed as the Minister of Ports & Shipping while Gamini Jayawickrama Perera, who captained the Nalanda team in the 31st Maroons Battle in 1960, was bestowed with the responsibility of being the Minister of Food Security in the new Cabinet of Ministers. Battle of the Maroons, Joint Organising Committee of Ananda and Nalanda considers this a proud moment for the two schools and wishes them the best of success in these new roles. Lal Hewagama, Sidath Waidyasekera, Jayasiri Ittepana, Mohan Gunadasa, Manjula Wijemanne, Samiru Muthugama and Bimal Wijesinghe represented the Joint Organising Committee at a simple ceremony organised at Ananda College, to hand over the cheques to the two principals. The Joint Organising Committee takes pride in the fact that they have been able to contribute Rs 20 million so far to the two schools ( Rs 10 million each) from profits made at their Big match since the joint committee undertook organising the match in 2009. You have been a great ambassador for the game of cricket - a true sportsman in word and deed. Though winning matches have always brought joy and pride to our nation, you have shown truly remarkable qualities in accepting victory and defeat alike. You will remain etched in our minds for your graceful artistry in batting which has made it look a very simple task and for your tactical acumen in leadership and motivational skills that has brought glory to Sri Lanka many a time. The records you have set are too many to list but the highest test score of 374 you made against South Africa and your world record partnership with your friend Kumar Sangakkara would stand tall for a long time. Sri Lanka will not forget the way you led the team to the world cup final in 2007 and your historic century in the 2011 world cup finals. Though we had to end as runners up, on both occasions you and your team won the hearts of the cricket world with the exemplary mannerism and conduct off the field, the same way you played the game to its true spirit on the field. 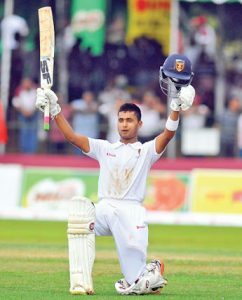 You have truly lived up to the resolution you made as a 15 year old lad, "that one day you will do your best to bring pride and glory to Sri Lanka"
We as Nalandians are more proud of you for The Spirit of Cricket Award you won from ICC, than any of your other awards, because that personifies the real character of Mahela we know. Taking first lease of the wicket Ananda scored 242 for 08 wickets at the end of their 50 overs in the 40th limited overs match. Sahan Arachchige top scored with 89 runs and Pasindu Thitmadura gave him good support with a knock of 38 to help them put up a formidable total for Ananda. In reply Nalanda had scored 16 runs for the loss of 02 wickets by the end of 06 overs when the match was interrupted by rain. As the rain continued till late evening , the 40th one day encounter had to be abandoned without a decision. 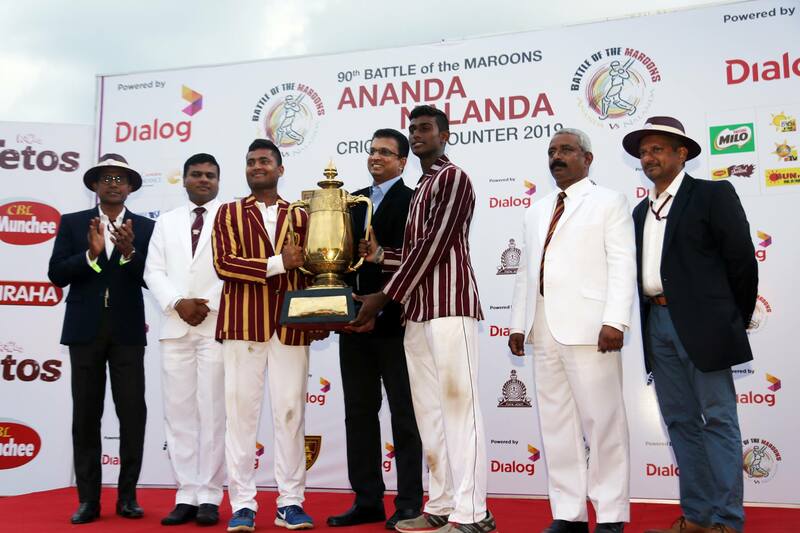 Ananda were all out for 170 runs on day one of the 85th Battle of the Maroons. Sahan Arachichige was the highest scorer for them with 40 runs while Lakkana Jayasekera contributed with 36 runs. Nalanda's opening bowler Anuththara Madawa captured 4 Ananda Wickets for 32 runs. The match had to be stopped due to bad weather immediately after Nalanda started batting. On the second day Nalanda scored 248 for 5 wickets in reply to Ananda's total of 170. Senura Amarasinghe scored 62 runs and Pramud Hettiwatta scored 46 while Malinga Amarasinghe who top scored for Nalanda with 90 not out had to miss out on a possible "Big Match century" as the match had to be stopped after Tea due to bad light and rain. Thus the 85th Battle of the Maroons ended in a draw with rain and bad light interrupting play on both days. 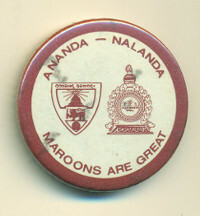 Way back in 1970's I bought a "pin-on badge" at a Big Match between Ananda and Nalanda and the inscription on that said "Ananda - Nalanda , Maroons are Great" - with the crests of the two schools printed in Maroon on a white back ground. There were no other colours on this badge. No gold , no silver only Maroon lettering on a white background. Todate every time I visit the Big Match this badge has been one priced possession I carry with pride. But why ? Why are the Maroons of Ananda and Nalanda great ? They are great because it does not matter to them whether they are from one school or the other as long as they could respect each other in true sportsmanship on and off the field. - because they believe that what matters more is the spirit of camaraderie and brotherhood than who wins or loses when they meet each other in their legendary cricket encounter year after year, now dating back over 8 decades. 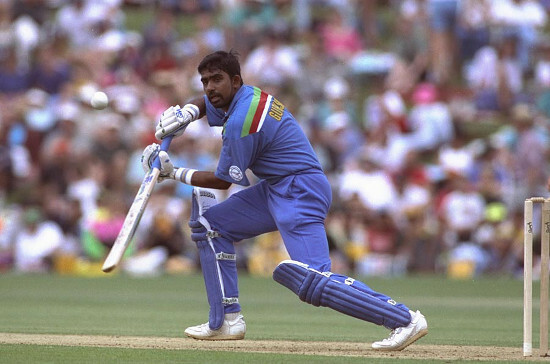 Maroons are great because it does not matter to them whether your position as a leader will be at stake as long as you fight for the rights of your team mates, like how the great Arjuna Ranatunga did in 1995 when our spin king Muttiah Muralitharan was penalised wrongly for his bowling action. They are great because they value being honest irrespective of whether you win or lose a game or miss a milestone like how the great Mahela Jayawardena walked out 9 runs short of a Test century, though at a crucial stage of a match against New Zealand, when he knew he had been caught behind. Maroons are great because they know that - when the time comes for the scorer to write against their names, he will not consider whether they were laced with Gold or lined with Silver as long as they have played the game in true sportsmanship of the Maroons. In keeping with the tradition of having a familiarisation workshop on new laws of the game, the Sub Committee for Technical Affairs of the Battle of the Maroons Joint Organising Committee conducted an interesting workshop on 26th March for players from Ananda and Nalanda. 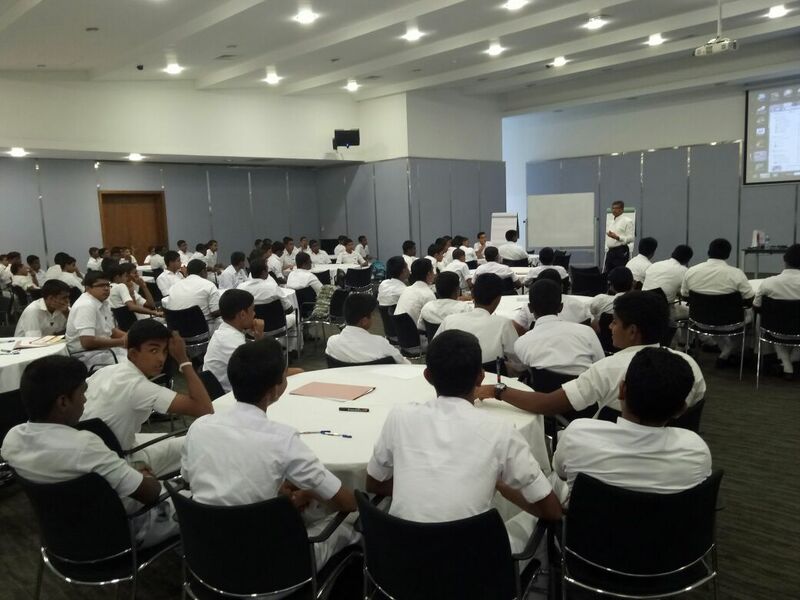 The Masters in Charge and the Prefects of Games from both schools were present at this workshop conducted by Mr Sena Nandiweera, a premier umpire in Sri Lanka, who briefed the participants about new rules of the game and also stressed on the spirit of sportsmanship that should prevail throughout the game. This workshop provided an ideal training ground for all the young cricket stars who are anxiously waiting for their turn to take part in the most important match in their school cricket career. The Technical Committee wishes to express its appreciation to all participants who were present on this important occasion. 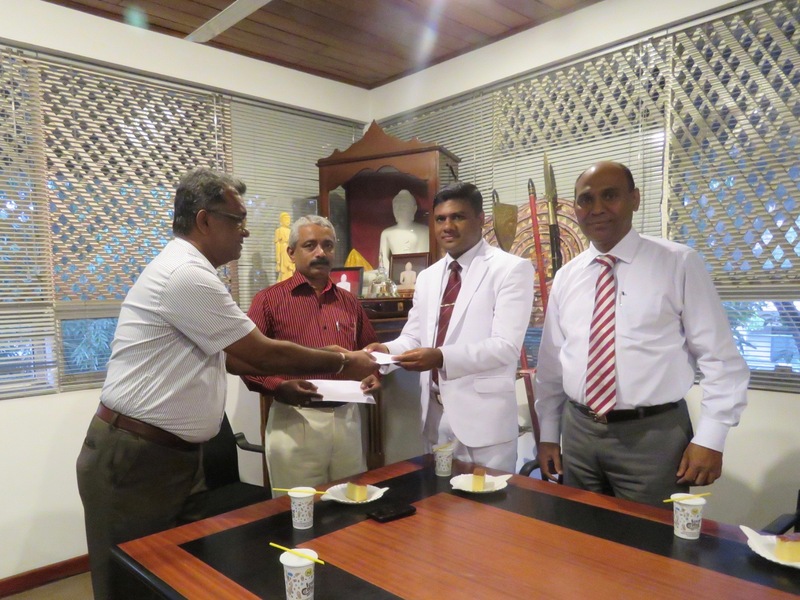 The joint organising committee has allocate Rs 2.5 million to each school, out of the profits of the 84th Maroons Battle and the payments were presented to the two Principals at a simple ceremony held at Ananda College on 11th of October. 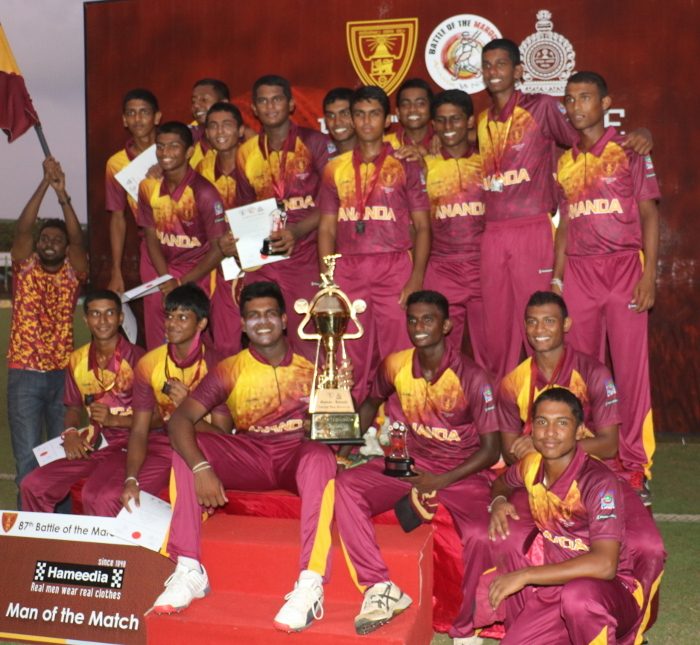 The 39th limited overs match was concluded successfully on 05th May at R premadasa stadium.Ananda won the encounter. Ananda College, Colombo, established on November 1, 1886, by the Buddhist Theosophical Society led by Colonel Henry Steel Olcott hass been a symbol of buddhism within and beyond the borders of Sri Lanka since its inception. In the early 1920's a few class rooms of Ananda, were set up at the far end of their play ground to house the primary section. The founding father of Nalanda - Mr P de S Kularatne - had the intention of turning this unit into a separate educational entity and thus transferred a set of "bright sparks" to these new classes. A few years from then saw the birth of a new educational entity which was named Nalanda with Mr Gunapala Malalasekera as its first Principal.Thus Nalanda sprung in to existence as a part of Ananda - like when a father builds another house for a younger brother in a family to stay in - Ananda and Nalanda are just two components of one family. Today, as two giants in the educational sphere in the country, Ananda and Nalanda have produced a vast array of illustrious sons whom we can all be proud of as Sri Lankans. It was in 1924 that they started the rich tradition of a friendly cricketing encounter - now called "the Battle of the Maroons", just to signify the competitive nature in which the game is played - though its more of a "cricket festival" of the maroons than a "battle". In 1975, the year that the first Cricket World Cup was played, Ananda and Nalanda commenced a series of One Day encounters.That first encounter saw the two teams captained by Sidath Wettimuni and the late Anura Ranasinghe, who was also a member of the Inaugural World Cup team of Sri Lanka.That match ended in a close finish Ananda emerging winners by just 3 runs having restricted Nalanda to 192 for 9 wickets after scoring 195 runs in their turn. The series of one day matches between the two schools have produced two centurions, Ananda's Marvan Atapattu scoring 118 in 1989 and Nalanda's Gihan Rupasinghe , 101 in 2006. Ananda has won the One Day encounter on 22 occasions while Nalanda has 14 wins to her credit with 2 matches having ended without decisions due to bad weather. Led by Thushara Samarakoon and Lahiru Jayakody respectively Ananda and Nalanda will battle it out for the P de S Kularatne Trophy, in their 39th One Day encounter on Sunday 05th May at the R Premadasa International Cricket Stadium commencing at 9.30 am. When the Nalanda batsmen knocked 298 for 5 wickets and declared their innings immediately after their star performer Pramud Hettiwatte reached his century in the 84th Maroons Battle, they had surpassed the highest total in the series by Nalanda - 290 runs scored in 1954. That partnership is also the highest for Nalanda in this series , eclipsing the 160 run stand between Carl Obaysekeara and Ashley de Silva way back in 1950. Avishka de Silva was 77 not out while Pramud Hettiwatte who stroked the ball to all corners of the field remained unbeaten on 102, with 12 boundaries to his credit, when Nalanda decided to declare with 5 wickets down. Pramud's innings was a treat to watch as he mixed caution with aggression and helped Nalanda to this record total with his partner Avishka. It was as far back as 1954 that Nalanda had reached the 290 run mark in a Big Match against Ananda. And 290 was Nalanda's highest total in this series until they came in to the 84th Maroons Battle, with a not so impressive batting record during the season. Having been put into bat by the Ananda skipper, Thushara Samarakoon, their chances did not look that great having lost 3 early wickets including their skipper, Lahiru Jayakodi, but opener Woshantha Silva with a hard hit 37 runs and Malinga Amarasinghe with a patient 60 runs added some respectability to the scorecard. Nalanda rattled a score of 298 and declared their innings with only 5 wickets down, in an attempt to grab the advantage of a wicket or two before close of play. It was all due to a solid batting display during the fifth wicket partnership of 167 runs between Pramud Hettiwatte who joined Avishka De Silva with the score at 131, that enabled Nalanda to take their total past the highest score in the series. As the month of March begins, the bands are ready with their drums tuned, the trumpets have been polished and the catchy beats have been practiced. Gold Silver and Maroon flags keep flying high. Ananda and Nalanda are laced with huge school flags. Wrist bands, head bands, pin on badges and many other souvenirs become available to the students. The clamour to buy them is unbelievable as many a junior boy wants to show their support for the "big heroes" on the cricket field. The prefects of the two schools play a friendly cricket match, the masters and teachers match their skills, not only in a game of cricket but at netball too. The big day is about to dawn. Strategic battle plans go on the drawing boards with guidance from the respective masters. There is a refreshing breeze in the air as the two schools that have produced the most number of international cricket stars in Sri Lanka and 6 national cricket captains get ready for their annual encounter. Another outstanding cricketer from Ananda College, Dinesh Chandimal, who captained his team in the Battle of the Maroons just 4 years ago was yesterday named as Sri Lanka captain of the T20 team. He has also been appointed Sri Lanka's Vice Captain in Tests and one-day internationals until the end of January 2014 according to a statement issued by Sri Lanka Cricket (SLC) on 14th February. 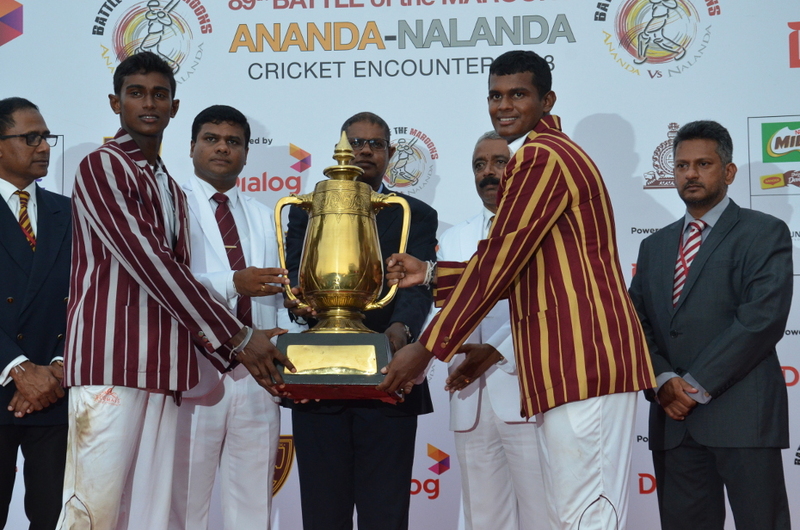 A proud moment for Ananada and Nalanda on the eve of the 84th Battle of the Maroons. 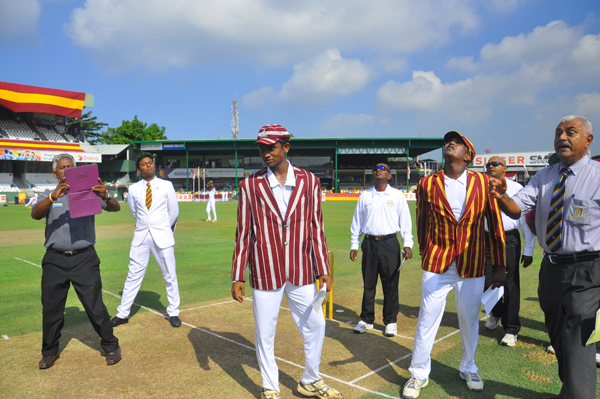 Since 2008 when the Battle of the Maroons was played at the SSC Grounds for the 80th time, this friendly cricketing encounter between Sri Lanka's two leading Buddhist educational institutions has experienced a new beginning where there has been a revival of the spectator enthusiasm with the introduction of a carnival atmosphere. The 38th limited overs match was concluded successfully on 11th at SSC.Ananda won the encounter. Ananda won by 21 runs. The 83rd Battle of the Maroons was ended in a draw at SSC. H E the President, the most distinguished Nalandian, was the first to sign the commemorative plaque of the 83rd Battle of the Maroons at a special ceremony held at Nalanda College. As we approach the beginning of March the excitement is gradually building to the Big Match season, the time when the future stars of Sri Lanka cricket show case their talent to the rest of the country. They keep dreaming about this day for months and months. Whether it be the players, the students or the prefects of the schools, this really is a big occasion for them , an occasion they look forward to from the beginning of the year while being keen partners of all the school matches in the season. It is the time for them to be clad immaculately in their cricketing attire or their white uniforms as the case may be and represent their respective colleges with pride â€“ something any schoolboy would remember for the rest of their lives. The first weekend in March will see the 'giants' in Sri Lanka Cricket gather at the SSC grounds. While the young cricket stars from Ananda and Nalanda take the field to match their skills in the 83rd Battle of the Maroons, the stalwarts from yesteryears will be there reminiscing the good olden days when they strolled down the ground to create many memorable moments for followers of the game in Sri Lanka. .
Ananda and Nalanda, together have not only produced the highest number of international cricket stars for Sri Lanka, they have also gifted us with excellent Cricket Administrators, elite Cricket umpires, respected match referees, leading sports media personnel and very importantly talented commentators with brilliant oratorical skills who were instrumental in popularising the game to this extent through the lengths and breadths of the country. . 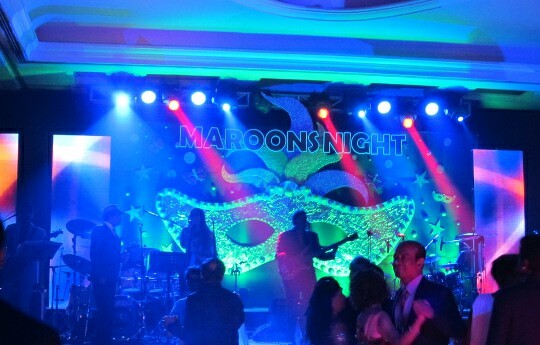 The inaugural dinner dance organized by the battle of the maroons joint organizing committee together with old Anandianâ€™s sports club and old Nalandians sports club, was a huge success..
Sri Lanka Telecom announced their Gold sponsorship of the 83rd Battle of the Maroons at a press conference that the â€œBattle of the Maroons Joint Organising Committeeâ€� held at the Atrium Lounge â€“ Cinnamon Grand Hotel on Wednesday 4th January. Do you know the correct way to play Cricket ? If you think you know a lot about cricket just because you can handle a bat with elegance or bowl some good yorkers or googlies that will put the opposing batsmen in a fix â€“ you are certainly missing some very important things that this noble game can teach you. 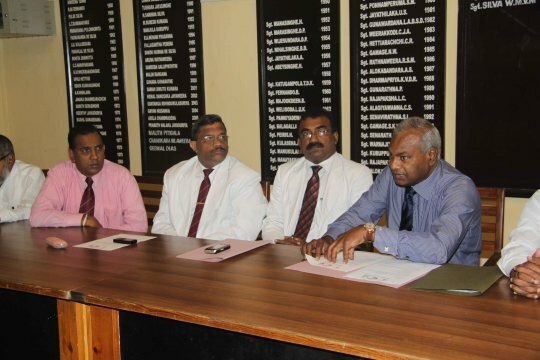 The Joint Committee set up to organise the 'Battle of the Maroons 2012' â€“ the traditional Big Match between Ananda and Nalanda which will take its 83rd step on 3rd and 4th March next year, organised what one could call a unique programme, hitherto not thought of by any other school in Sri Lanka on Monday 14th November at the Language Centre Hall at Nalanda College. This was a Personality Development Programme for about 70 young cricketers in all, 35 from each school, that included the entire squads of both the first XI and second XI teams for a knowledge gathering exercise. The inaugural planning meeting for the 83rd battle of the maroons was held on 30th September. The joint committee for the next term will be, headed by Mr. Nishantha Ranatunga (Ananda) and Mr. Sidath Waidyasekara (Nalanda). 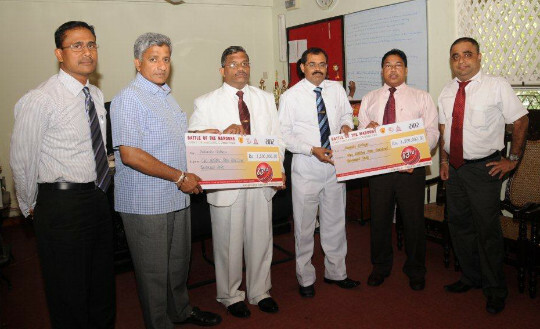 A ceremony was held at Nalanda College , language lab on 08th June 2011 to distribute the profit earned from the 82nd battle of the maroons to two schools Ananda and Nalanda. The 37th limited overs match was concluded successfully on 13th at SSC.Ananda won the encounter. Last Saturday and Sunday ( 5th and 6th March) saw a galaxy of cricketing greats gathering at the SSC, not only those who were on the turf for the 82nd Battle of the Maroons, but those from all walks of life that were there to witness this fascinating cricket fiesta. And a prelude to this great gathering took place on Wednesday - 2nd March - evening at the SSC pavilion when the Past Cricketersâ€™ Association of Nalanda College (NPCA), felicitated their former coaches and masters in charge who in their prime days had been the mentors behind the great cricketers that Nalanda had produced. The 82nd Battle of the Maroons was ended in a draw on 06th at SSC. 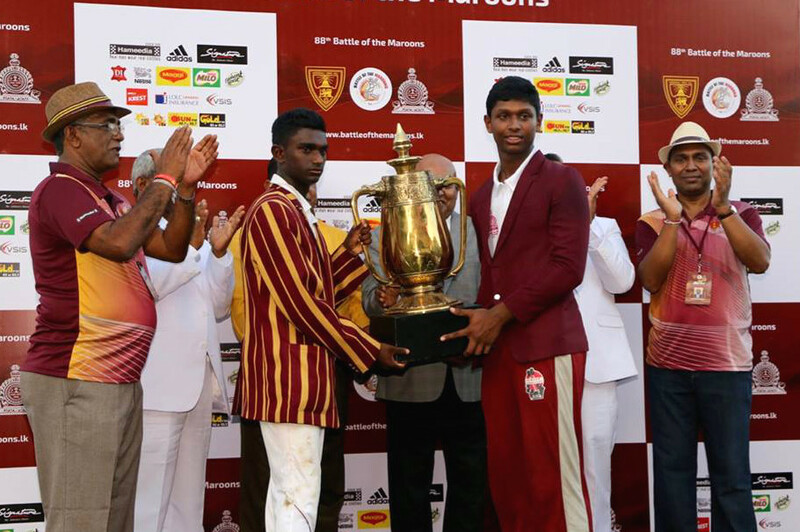 It started in 1924 as a friendly game between two brothers, in a cricket match - and from the very next year it became an annual encounter which has now blossomed into a much sought after Big Match among the Sri Lankan cricketing public â€œthe Battle of the Maroonsâ€�. This is the 82nd time these two leading educational institutions meet on a green surface to bring out the best in them . During this long history of 81 years hardly any one would remember any rivalry between them . Although they are called Traditional Rivals there is no rivalry shown other than when in the middle of the ground and battling it out to get the best of the cherry. During this period many great men have played this match and hundreds of thousands of people have watched this encounter thus making it an event with lots of traditions and historical values. This much awaited match is played during the weekend on a Saturday and Sunday in the month of March , unless the Full Moon Poya falls on one of these days . Match dates are pre fixed and under no circumstances will these dates be changed . The 82nd Battle takes place on the 5th and 6th of march 2011, on which day the Sri lankan cricket team meets Australians in a hotly contested world cup league match . This is the month of Big Matches. Last Sunday I saw a significantly small article written at one of the leading Sunday national news paper in English on annual battle between Ananda and Nalanda. This is very common in last decades. But again we can observe more articles (especially in English) which went for pages written on other big matches played in Sri Lanka. But I think there is a symbolic importance in the big mach between Ananda Vs Nalanda than any other schools in Sri Lanka. Simply they are the only 2 schools produced more test cricketers to the nation! But traditionally cricket and English go inline and there was a myth that if you know English then only you can play cricket. Daltan Wakwellaâ€™s article on â€˜How P.M Jayathilake scored 111 â€™ dragged my memories to my schooldays in 1972 to Bandula Warnapuraâ€™s record braking knock of 118 (not out). As Dalten has mentioned by then many players have attempted to pass this magic score of 111(not out) by PM without much success, closest being Carl Obeysekara who got out for 111. 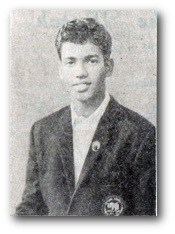 Bandula captained Nalanda in 1971 and had an illustrious career as a school boy cricketer being a member of the Sri Lankan School cricket team who toured India and later captaining the schools team in the successful series with the visiting Australian School cricket team. By the Big Match day in March 1972 every cricket enthusiastâ€™s attention was drawn to Bandula who has already had a successful season with a number of centuries for Nalanda under the captaincy of Nandadeva Perera. Those days as school boys the only page we used to read in the English news papers was the last page and on that Friday the Daily News ran itâ€™s sports page head line as "Warnapura against might of Ananda". Ananda in that season had the most number of wins and were favourites to become the best School Cricket team of the year. The 10th Cricket World cup is here and what better times for us Sri Lankans to reminisce the glory of our triumph in 1996 and savour the good things that this noble game of cricket teaches us. While joining the millions of Sri Lankans who fervently hope that we would repeat the feat, a sincere wish that goes across my mind is - that our team will remind the world the true spirit in which this game should be played. 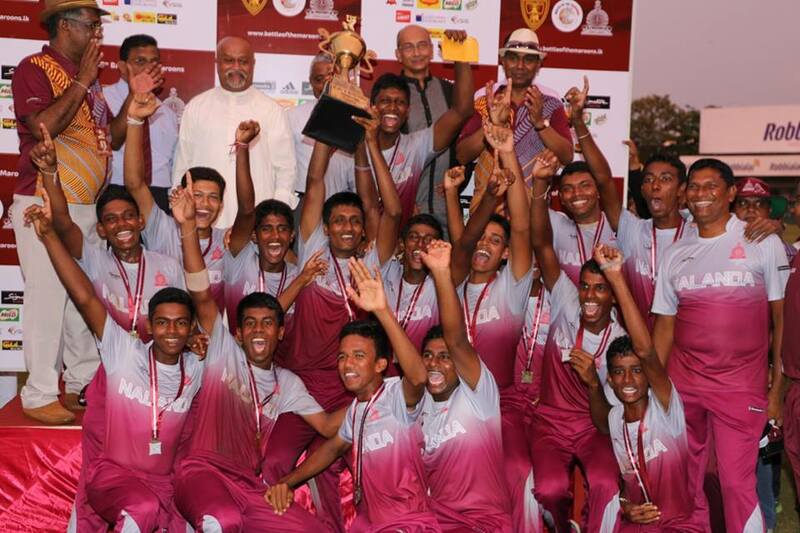 Amidst all the euphoria of the world cup that is taking centre stage, we in Sri Lanka will get a rare opportunity of witnessing another great cricketing encounter that has enlivened this spirit and continued in all its splendour year after year for over 8 decades â€“ when Ananda takes on Nalanda in their 82nd Maroons encounter at the SSC on 5th and 6th of March. Way back in the early 1920's a few class rooms for Ananda College were set up at the far end of their play ground to house their primary section. The founding father of Nalanda - Mr P de S Kularatne - had the intention of turning this unit into a separate educational entity and thus transferred a set of â€œbright sparksâ€� to these new classes. A few years from then saw the birth of a new educational entity which was named Nalanda with Mr Gunapala Malalasekera as its first Principal. Thus Nalanda sprung in to existence as a part of Ananda â€“ like when a father builds another house for a younger brother in a family to stay in â€“ Ananda and Nalanda are just two components of one family. As two giants in the educational sphere in the country today, Ananda and Nalanda have produced a vast array of illustrious sons whom we can all be proud of as Sri Lankans and most importantly the brotherly spirit that continues to exist among the two schools is something that is unique in any part of the world. 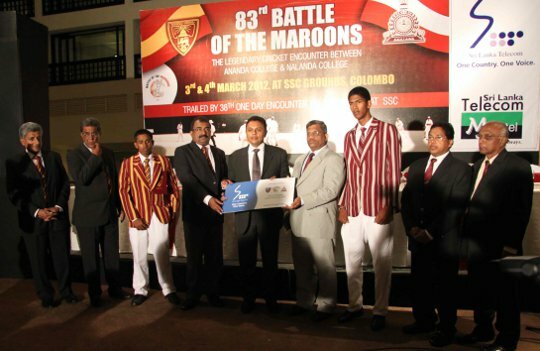 The 82nd Battle of the Maroons , the Maroons celebration of the year will be held on 05th and 06th March and the One day match will be played on 13th of March at the SSC. This will be an event for the whole family where entertainment will be provided for everyone irrespective of ther age. The joint committee has also taken steps to show the Sri lanka â€“ Australia day-night match telecast on giant screens where all of us can enjoy the world cup match under the stars.The 82nd Battle of the Maroons , the Maroons celebration of the year will be held on 05th and 06th March and the One day match will be played on 13th of March at the SSC. This will be an event for the whole family where entertainment will be provided for everyone irrespective of ther age. The joint committee has also taken steps to show the Sri lanka â€“ Australia day-night match telecast on giant screens where all of us can enjoy the world cup match under the stars. Last year the IT Team of the joint committee, successfully used RF ID technology for selected tents (Brothers and Family). This year this innovative technology will be used for all the tents, where an RF ID card will be issued instead of standard tear off tickets. The SSC will be covered with a wireless network and the spectators' in/out times will be recorded on a real-time basis. This will help the organizing committee to stream-line the ticketing process and get statistics on ticket sales on a live updated basis. Unlike last time , each tent will have separate entrances and exits, and the tents will be provided with the best of entertainment. The â€œBrothersâ€� Ticket holders will have the privilege of moving around and visiting any of the above tents at anytime. 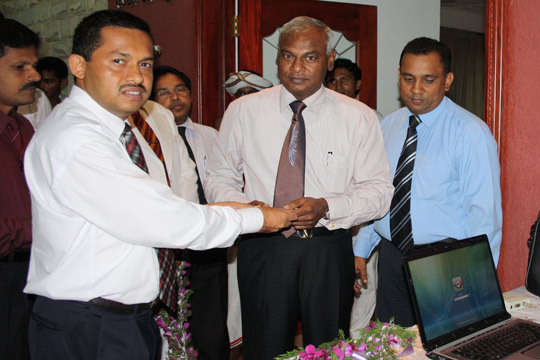 A simple ceremony was held at Ananda College , Centenary hall on 02nd December 2010 to distribute the profit earned from the 81st battle of the maroons to two schools Ananda and Nalanda. The 36th limited overs match was concluded successfully on 14th at SSC. Ananda won the match with total of 207 runs while Nalanda was all out for 169. 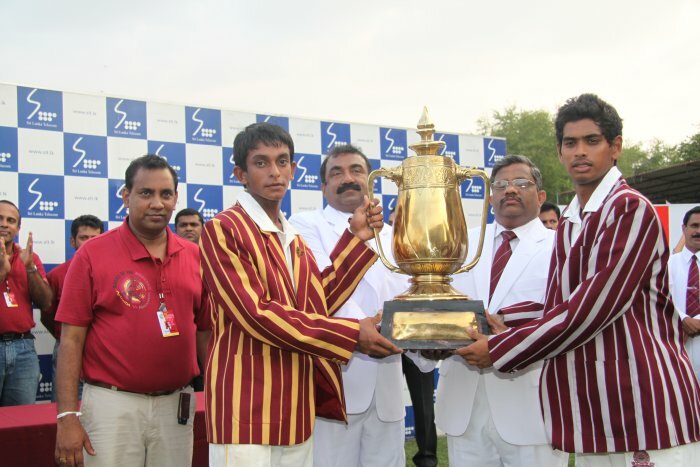 The 81st Battle of the Maroons was concluded successfully on 07th at SSC. The 81st Battle of the Maroons will create the history in Sri Lankan sports, by introducing RF ID (Radio Frequency Identification Device), Technology to track the Spectators. The Spectators would be given an RF ID card as opposed to the conventional tear off tickets. The cards are to be brought closer to the Proximity Reader as and when the spectators in-Gated and out-Gated. The Gates are equipped with the Readers and there will be a Display, to monitor spectator In and Out movements. This would streamline the ticketing process as opposed to a third person checking the tickets manually as in conventional process. The System was fully designed and implemented by the Battle of the Maroons Joint Committee IT team. Battle of the Maroons going strong! The traditional cricket encounter between the two leading Buddhist institutions Ananda and Nalanda will be played this weekend. This is the 81st occasion they battle it out for cricketing supremacy. Over the years these two schools have developed a unique tradition in this series while the game of cricket is played according to the highest standards in the world. This was quite evident when the Sri Lankan Cricket team won the spirit of cricket award twice under the proud captaincy of Mahela Jayawardena who learned the basics of the game, its finer points and values in his younger days at Nalanda. Cricketers produced by these two schools have always been maintaining high standards at any level of the game. The 81st Battle of the Maroons Press Conference and the Web Launch was held at SSC on 25th, with the participation of principal sponsors, Sri lanka Telecom and Sri Lanka Telecom/Mobitel. Mrs. Leisha De Silva Chandrasena the Chairperson of Sri lanka Telecom, Mr. Suren J Amarasekara, CEO/Sri Lanka Telecom/Mobitel and Mrs. Vijitha Ratnayake, Deputy Chief Corporate Officer, Sri Lanka Telecom participated together with the Big match Joint committee Chairmen Mr.Upali Dharmadasa, Mr.Ravi Ahangama, Ananda College Principal Mr L.M.D.Dharmasena , Nalanda College Deputy Principal Sarath Gunathilake and the two captains Matheesha Perera and Dinuk Jayasinghe. 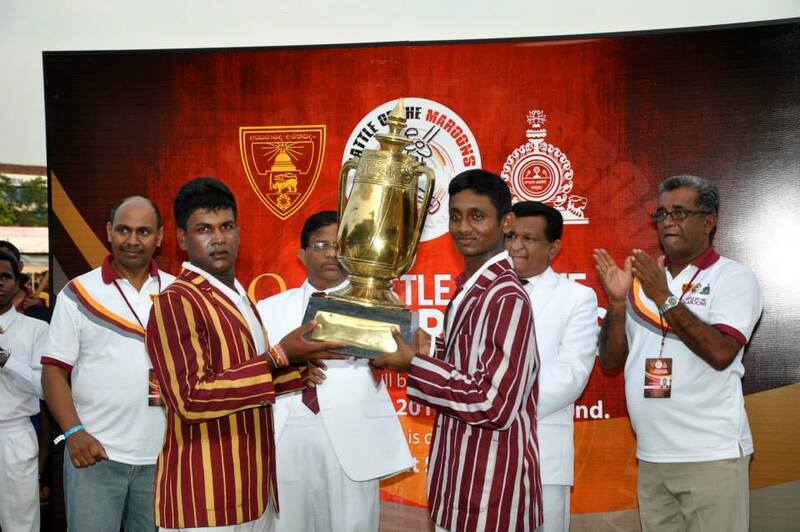 The first Ticket for the 81stBattle of the Maroons was sold to Big Match Joint Committee Co-Chairman Mr. Upali Dharmadasa. This was done at the Nalanda college, Language center at an auspicious time on 18th of February. Representatives from both schools, including members of the Joint Organising committee, Principals, Prefects and other well wishers were present on this occasion.